Quidditch, as created by Fun Activities, has elements of Rugby, Dodgeball and Football all mashed into one. We have seen both kids and adults running around with ‘brooms’ in between their legs at team building events, cohesions, gatherings and school programmes. Fun Activities provide this fun in a 20m (L) x 10m (W) inflatable arena with water at least shin deep. Our Water Soccer has attracted students and even teachers to throw aside their hesitance to get wet. Though slippery, our professionally trained facilitators ensure safety at all times so everybody can have a splashin’ good time. Fun Activities believe in reaching maximum engagement for the participants and making sure as many people are actively having fun at any one time. We provide either a 12m (L) x 6m (W) or 20m (L) x 10m (W) inflatable so you can have 10 people or 20 people in one Human Foosball arena. Fun Activities ensures you get your fun anywhere - whether it’s indoors or outdoors. 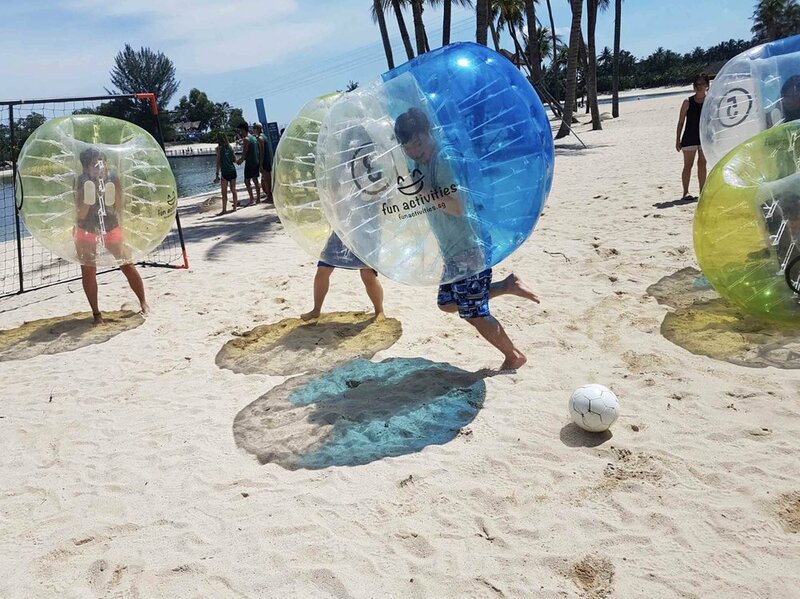 Using an inflatable zorb-like bubble suit, you can collide into other players (or even your own team mates!) and find yourself literally rolling around. Shoot or Be Shot! Get together with your friends family and even colleagues & Shoot your way to victory. Suitable for all ages; SpeedTAG brings to you an immense amount of energy, laughter & fun and a really good time snowballed at you. Teams will try to capture the opponent’s flag whilst defending their own. Archers at Base! Set & Ready…. Game ON! With the onset of these commands, adrenaline courses thru the veins in a rapid barrage of action. The improbable marriage between archery, paintball & Dodgeball has given birth to a new sport and it’s taking the local scene by storm. Now it’s your turn to shoot up lightning quick arrows at your opponents. Up the ante by catching arrows flying at you! Build your own raft with materials provided by us and engineering creativity that you already have in you! After completion, it's time to see which team's raft floats the best. Or even floats at all! Unite your team and eliminate your opponents together! Players on both teams try to throw balls at each other while avoiding getting hit. Make sure you make your throws count but most importantly - DODGE! There are 5 field players and 1 goalie on each time. Each field player uses a light carbon graphite stick with a scoop netting to shoot and catch the ball. Objective: To score as many balls as possible into the opponent's goal past the goalie! Cradle, catch, pass, use all the skills you have with the stick to emerge victorious! A cross between Charades and Bingo, you got to guess correctly to get your chance at crossing out your numbers. Everyone on the team plays a part whether your contribution is brain or brawn. Only one goal in mind: B-I-N-G-O! We bring you the nostalgia of playing cards to the team building experience! The cards are as big as an average adult’s torso. Instead of 4 players, now even 40 or 50 can play at the same time. Teams have to play against each other and ensure they can clear their cards the fastest. Teams have to undertake measures so that other teams cannot peep at their cards. Planning a SPORTY theme for your event? We can help you plan, set up and manage for you. Let us do the heavy lifting. You have made your first step to having FUN with us! Don’t worry, Fun Activities have got your covered ;-) While waiting for the team to get back to you, do check out our other fun and cool stuff on the website and like our Facebook page here! And remember, The Fun Starts Here!